The following is an excerpt from Saved by an Angel, a biographical memoir by the late Stuart J. Byrne, whose business career included international management, system analysis, multi-country system installation, and large scale procurement and inventory control management for employers such as Litton Industries and NATO. 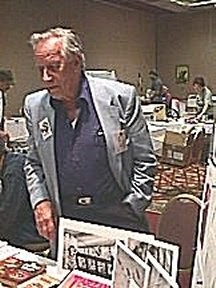 It recounts a 1947 meeting between Byrne and Richard S. Shaver, who became one of science fiction's most controversial figures when his claims (that he had personally discovered underground caverns filled with the abandoned scientific machinery of the Lemurians, who had fled Earth when the sun's rays changed millions of years ago) were presented and championed by editor Raymond A. Palmer in the pages of Amazing Stories. At the time of this meeting the Shaver controversy, known as the Shaver Mystery in Amazing, was at its height. Futures-Past Editions is presenting this excerpt for a short time, due to the increased interest in things Shaverian following the publication of War over Lemuria, Richard Toronto's succinct and levelheaded account of the Shaver Mystery, as well as Shaver and Amazing Stories' editor, Raymond A. Palmer, the two men whose personalities and positions made the Mystery grip the world for a short, meteoric moment, leaving both men's lives in ruins. 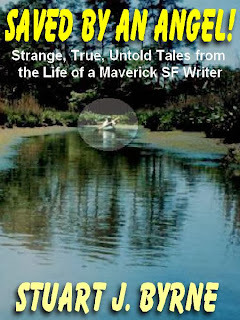 "I don't recall whether it was by bus or thumb that I found my way to Shaver's place, a cottage at the edge of what I believe was Fox Lake, northwest of Chicago. Nor do I recall his features other than the fact that he never smiled. But he did express an intense interest (he was always intense) in my South American experiences. This related not only to my Incan lore and following the trail of Pizarro in the Andes, but particularly my association in Lima with the renowned explorer, Thor Heyerdahl, at the time of his prepping the famous KonTiki expedition. Heyherdahl had been interested in my account taken from the Royal Commentaries, with regard to an invasion of giant cannibals into northern Peru three centuries ago. This was because it tied into his theory concerning the Puget Sound Indians who were giants and had disappeared. His theory was that they had migrated south while riding rafts on the ocean currents. Shaver was keenly interested in anything pertaining to giants, so I commented that this was in contrast to his underground Deros who, according to his account, were dwarfish ogres. He gave me a penetrating look and insisted that somewhere there must be a subterranean world of giants. In support of this he quoted Genesis 6:4: "There were giants in the earth in those days." And he asked me to pay particular attention to the preposition, "in" (i.e., in the earth). He said there must be something profound about it, since it can be found in any King James version whereas the Catholics got to it and changed it to "on the earth." This was how we at least did a little professional bonding during the first few hours of our meeting. After a while, however, there were strange gaps of silence during which he watched me with a knowing intentness. He pointed out what I hadn't noticed, that I had begun to pace back and forth. "You feel tense," he stated. He did not say that it seemed to him that I was tense. The eerie part was that he told me that I was tense. And I confessed, telling him that I was somehow becoming increasingly uptight. "I feel like I could take your typewriter and throw it through the window," I told him. "It's Max," he said. "He's getting to you." Then the real story came out – the one I had come for. But there was something darker in the theme than I was prepared for. In the Shaverian underworld, ancient machines that had generated oxygen were nuclear powered but had deteriorated. The resulting radiation had been the cause of these creature's degeneration, but the degeneration had been of mind, as well. Because of their dwindling numbers, and knowing that any attempt to emerge into the surface world would result in their decimation, they had developed a negative mind-set that nurtured a hatred of humanity and the desire to either control us or destroy us. To this end they were equipped with ancient ray projectors which could inflict pain or in some cases madness, suicidal or murderous inclinations. However preposterous all this might appear to be, the fact challenging me that day was that something was building me up to some kind of an explosive reaction. As to the one called "Max," Shaver explained that this little ogre was determined to drive me away. Then he gave me the shock that he couldn't help the fact that Max was "queer" for him and was jealous of anybody who got too close to him. (As I reflected later, this might explain what had happened to his "familiar," the depilated angora cat.) The whole matter was to me both ridiculous and intolerable, so I asked him, point-blank, what the hell I was supposed to do about it. He quietly suggested that getting out of Chicago would be a practical solution. I had planned to remain in Chicago for another week before going on to my home town of St. Paul. This was because Ray Palmer was planning a little "open house" affair at his Chicago home to allow authors and leading sci-fi fans to mingle. Both I and Shaver were on the RSVP list, so I told him I was going to hang around until I could at least attend that event. He merely shrugged and said it was my call and that I was not to hold him responsible for any of the consequences. I can firmly attest to the fact that, in my hotel on the night before Ray's party, I was "visited" by an excruciatingly vivid nightmare. I was floating six feet above my bed while giants were carving out my armpits with razors. The next assault came the next day while I was at the Palmer affair. Shaver apparently knew what was happening because he finally sidled up to me and spoke over my shoulder. He asked me, "Is he getting to you?" I told him that he had to do something – to call Max off – because I had two swords up my back and wasn't going to be able to stand it much longer. He merely shrugged again and reminded me that my only recourse was to get out of Chicago. I said goodbye to Ray with the excuse that I wanted to visit a certain author in town that afternoon. Later, while walking up Western Avenue in Chicago, I had to stop because of a sensation that my lungs were filling with sulphur. There was no construction project nearby or any other possible source of the gas. So in spite of all traditional logic and sanity, I spoke to the sidewalk, meaning Max. I told him to lay off and I would leave. 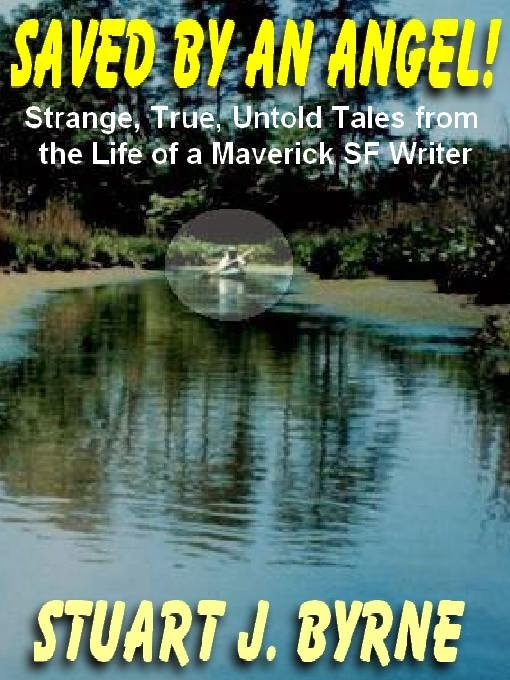 Those interested in learning more about the background of this meeting and more of Mr. Byrne's off-trail encounters during his travels around the world and back home in the USA, are encouraged to read SAVED BY AN ANGEL & Other Strange, True and Untold Tales from the Life of a Maverick Science Fiction Writer, only $3.99 for Kindle. Find out more about the late pulp science fiction writr Stuart J. Byrne at his Facebook page. Copyright 2008 Stuart J. Byrne, may not be reprinted with out express permission of Futures-Past Editions.